The Glass-House Community Led Design > Events > Glass-House Event > Place: a shared responsibility? “Who is going to be the maker of the change?” declared one of our speakers at the final debate of our 2014/15 Series. This call to action for civic responsibility is one that many answer but others do not. Yet so often we decry the lack of care shown for places. What is the relationship between the rights we have in our places and spaces, and the responsibilities we have for their care? How can we work better together as citizens with those responsible for managing our places and are there new models for collaboration we should try? The debate will be chaired by Glass-House Chief Executive, Sophia de Sousa. This debate is supported by our local partners Nottingham Trent University, The Creative Quarter and RIBA East Midlands. Special thanks to RSA Midlands for its support for this event. This year’s Series, A Place for Everyone? has emerged from discussions we have observed and participated in around the common elements in place that bring us together, the points of tension within them, and the role of the individual and the community. In partnership with the Open University and the Academy of Urbanism, we want to explore how we design and shape our environment today to create a place for everyone and what that means for concepts like shared assets and common good, alongside individual aspirations, ownership, diversity and, rights and responsibilities. Edinburgh / 21 October 2015 / Place: designed for sharing? Manchester / 11 November 2015 / Place: the sum of parts? 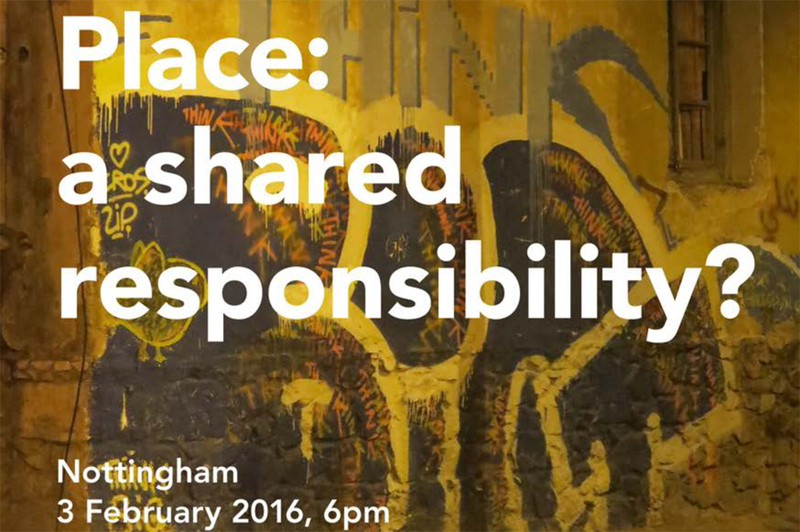 Nottingham / 3 February 2016 / Place: a shared responsibility? London / 9 March / Place: who belongs here? Register for Event: Place: a shared responsibility?